A clear blue variety of Pinchusion from the ‘Perfecta’ series. 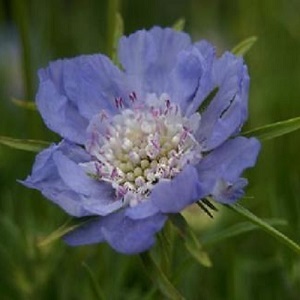 These plants grow elegant blue flowers on long strong stems, making this an excellent border plant and cut flower. Plants grow to a height of about 60cm and attract lots of butterflies and bees into the garden. These are sturdy plants but may need staking in exposed gardens. Scabious grows well in full soil and well drained soils. The plants flower for a very long season, from June/July to September. They die back in the winter, after flowering, and start growing again in spring. Pack of 50 seeds. Sow seeds in spring to autumn. Sow by March for first year flowers. Sowing instructions and a colour photo are printed on the packet. 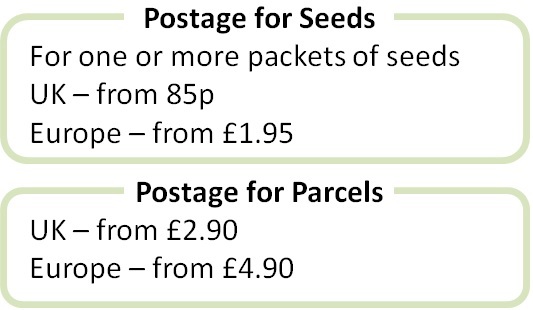 Sow by March for 1st year flowering or into autumn for next year flowers. Sow in a tray of moist seed compost, covering lightly with vermiculite or compost. Keep at 20-25°C and germination takes 2-3 weeks. If sowing in autumn, protect seedlings overwinter in a cold-frame or greenhouse and plant out in spring. Grow Deadhead plants down to the nearest bud to prolong the flowering into autumn. Clear dead material from the plants in winter, leaving the new green growth at ground level. Mature plants forms clumps which can be divided every 3 to 4 years in spring to keep the plants in good shape.